2011.03.12: What do you mean, reading about draft picks isn’t as much fun as winning three in a row? Good article in the Citizen today. James Mirtle had a great post on his old, now defunct blog, where he analyzed the sharp drop off in the quality of players outside of the top ten picks, and then again beyond the first round. Essentially, once you’re getting outside of those prime players, what you’ve got is a lottery ticket, the likely payout being a marginal NHLer or third liner. 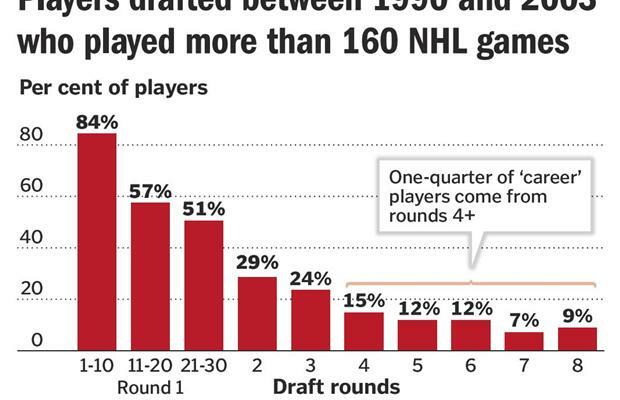 But what the Citizen article adds is how after the sharp drop off occurring in rounds two and on, there is as much probability of player in later rounds of making the NHL as the mid-rounds. Which is to say: not a very good chance (about a 15% chance of playing a significant number of NHL games). Food for thought, though, considering this team just gave up Alex Kovalev for a 7th rounder and Ruutu for a 6th. The notion is that these are worthless picks, but not so. In the days ahead, I’m sure there will be plenty written about Larssen v. Landeskog v. Couturier and on and on and on. (Newest I’m reading is that the team is high on Strome, and would love to get him with a later 1st.) What will be interesting is reading about those “no names” in the lower rounds. The Senators have three picks in the 2nd round (and possibly a fourth, if Nashville turns around their sagging game and makes the playoffs, then wins a couple of rounds). Who should they pick there? What about in the third round?